How much does a cloud weigh? That was the question Karen LaMonte asked us in an email a year and a half ago. LaMonte—an artist who lives in Prague and is known for monumental sculptures in ceramic, bronze, and glass—wanted to create a marble cloud sculpture of similar weight as a real cloud. 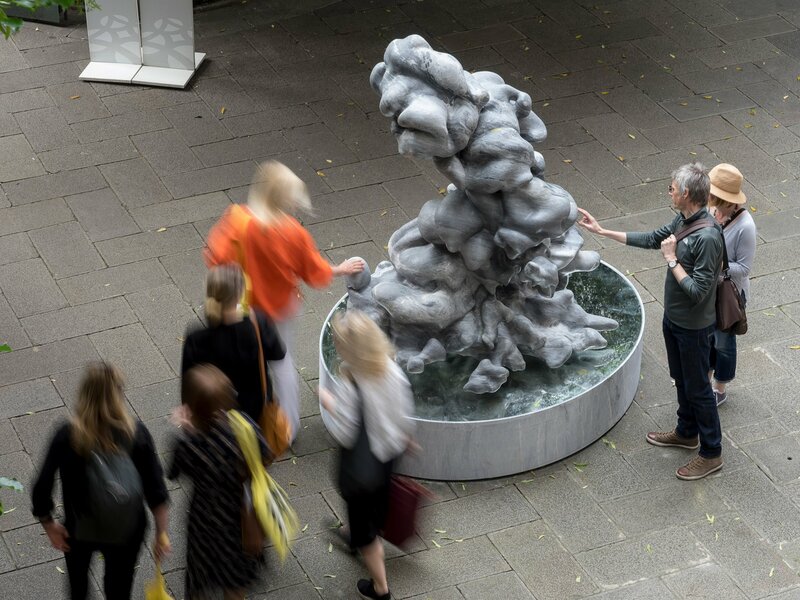 What resulted is LaMonte’s sculpture Cumulus, which is an accurate visualization, in marble, of a numerically simulated tropical cumulus cloud. Cumulus is currently on display during the Biennale in Venice. LaMonte had already been contacted by an Italian foundation about including her Nocturne sculptures in an exhibit during the 2017 Venice Biennale, a major international art show that takes over the Italian city every other year. When she told members of the foundation about the cloud project, their interest was piqued and they agreed to include that work also. “The Biennale timeline moved the deadline way up,” says LaMonte, who now had extra motivation to translate her vision into reality in a timely fashion. Schneider, the Frank J. Gilloon Professor of Environmental Science and Engineering, who also has a joint appointment with JPL, was intrigued when he received LaMonte’s email. Observations of clouds with enough three-dimensional detail to translate into a sculpture are not available, but the equations governing clouds are known, and so the structure of clouds can be computed. Caltech research scientist Kyle Pressel, who is part of Schneider’s group, worked closely with LaMonte to produce the cloud simulation from which she would create her sculpture. Over a period of five days, using a supercomputer located in a facility on the shores of Lake Lugano in Switzerland, Pressel and Schneider undertook one of the larger cloud simulations they had attempted. Their goal: model conditions that would create a cumulus cloud worthy of sculpting. To do so, they modeled their simulation on conditions that occurred during the Barbados Oceanographic and Meteorological Experiment, conducted in the summer of 1969. The result? “A classic cumulus you’d see while lying on a beach in Barbados,” says Pressel, “a postcard Caribbean cumulus.” Or, in reality, a triangulation of the surface of such a cloud. It took the robots four weeks of carving and LaMonte an additional four weeks of hand-finishing before the 15-ton block of marble she had previously picked out from a quarry in the mountains of Italy assumed its final form as Cumulus, a 7-foot-tall, 2.5-ton sculpture on exhibit outside Venice’s Palazzo Cavalli-Franchetti through November 26, 2017.